I have added an exFAT radio button to RMPrepUSB. You can format with a BOOTMGR bootsector or a GRLDR bootsector. This means that you can boot grub4dos directly from an exFAT volume if you prepare it with RMPrepUSB. RMPrepUSB uses the Windows format dlls, so you need XP with the exFAT update installed, or Vista SP1 or later versions of Windows. Just a small change to runwinnt.cmd (installl XP using WinPE ISO) so that a free drive letter is always used (e.g. Z:). If you are likely to have more than 8 drives in the system that you boot it on (e.g. several HDDs and partitions + maybe a 5-slot card reader) then please update your version of Easy2Boot. XP install from WinPE modified - can now choose folder where PE ISO is located and can skip partition format and install to an existing (active, primary) partition. BETA21 adds a new XP install method. One is the XP ISO that you want to install, the other is a Vista, Win7 or Win 8 ISO. It can be a Windows Install (DVD) ISO or just a WinPE (v2/3/4) ISO. The system will boot to WinPE using the Vista/7/8 ISO and then mount the XP ISO and runs WINNT32.exe to install the files inside the XP ISO onto the pre-formatted hard disk. You can specify a HDD partition size in the grub4dos menu (HDD0 is wiped) or you can specify which partition you want to be formatted that is already present on HDD0 once it has booted. You can also specify an unattend.txt file to automate the XP install. This is all done from unmodified ISOs. The XP ISO does not even need to be contiguous! Also, this is a 1-step process - you do not need to boot back into Easy2Boot again for Step 2. Because Win7/8 PE has most drivers, there should be no issue with AHCI and mass storage drivers - as long as the drivers are integrated into the XP ISO you are installing (so no F6 to press). Details are on the website page 72a. BETA21 is at the very bottom of the page - download -> click here. PLEASE report back with comments if you have tested this (especially if you have tried the new XP install using WinPE function). BETA20 has a changed menu structure which is now much tidier. I have kept main folder as _ISO as this is useful for Zalman VE200/300 owners. So everything is now under \_ISO. The \winvblock folder is not needed (AFAICT - not sure why it was in there to start with!!!). The location of the grub folder is configurable if you edit the \menu.lst file, but the location of the firadisk folder and \_ISO folder is fixed, so there is little point in moving the grub folder. If you want test it out, click BETA20. P.S. Whilst testing, I found that the autounattend.xml in the root of the flash drive had a problem and the symptom was that Win8 did not run LOADISO.cmd and the blue console windows did not appear, resulting in a 'need CD driver' message. This issue was reproducible, but went away when I edited the firadisk\auwin8.xml file again (it had been edited to change the file paths). If you are testing any Vista/7/8 installs and the blue 'LOAD WINDOWS ISO USING FIRADISK' console window does not appear before Setup runs - check the \Autounattend.xml file on the flash drive - in my case the KEY had not been replaced correctly resulting in <KEY12345-AAAAA-BBBBB-CCCCC-DDDD-EEEEE instead of <KEY>12345-AAAAA-BBBBB-CCCCC-DDDD-EEEEE. You can now define the text that appears in the Main Menu for the AUTO, MNU and Windows Install menu entries, and also define the titles of these menus and the default menu item for each in the menu.lst file. Copy the \grub\menu.lst file to \grub\mymenu.lst and edit it to your own preferences. The colour of the help text at the bottom of the screen will now be in the same colour as the Menu headings (was always cyan). If you have made your own mymenu.lst, please make a new one using the new menu.lst file as it has all the extra settings. I think I am getting near to removing the 'BETA' status now. The full release version will be v1.0. If you have any suggestions, bug reports or comments please let me know now! v2. 2013-04-23 Bug found in Win8 menu in first version of BETA19 - please re-download to get version 2 of BETA19. Also mainmenu.mnu file changed back because the default menu numbering is mucked up by the gaps in the menu! v3 2013-04-24 Mainmenu.mnu changed so you can delete the \_ISO\MNU and \_ISO\AUTO folders and the menu items for these will not be listed in the Main menu. Mainly changes and bug fixes to Windows menus. Win8 now has a menu for an ISO which has a modified EI.CFG (the ISO does not requires a key to be entered before installation) - so this can be used for an All-in-One modified Win8_NOKEY.iso. The Choose any Win8 ISO menu entry now gives you the choice of 5 keys, or you can enter your own key or you can say that a Product Key is not required (for those ISOs which have a modified ei.cfg file). Download is on Tutorial 72a page as usual. 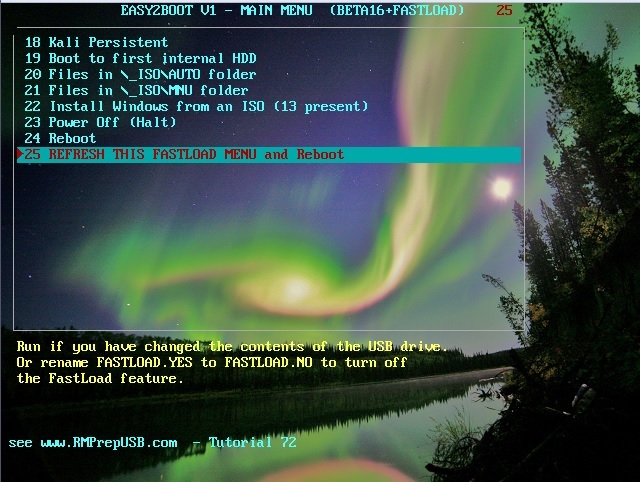 If you rarely change the contents of the Easy2Boot USB drive, you can enable FASTLOAD to greatly speed up the loading of the first Main menu. When you do this and reboot, the Main Menu will be cached (into \grub\FASTLOAD.MNU). From then on the cached Main menu will be used every time you boot. So if you add any more ISO files or change the payload or .mnu files on the USB drive in the \_ISO\MainMenu folder you will need to refresh the menu. To Refresh the menu cache, choose the last menu item in the main menu (see screenshot) and it will reboot and refresh the cache. This means that for everyday use, the Easy2Boot drive will boot much more quickly, but you do need to remember to Refresh the drive whenever you change the contents. The Menu title will have 'FASTLOAD' after the version to indicate that you are in FASTLOAD cacheing mode. To disable the mode, rename \FASTLOAD.YES to \FASTLOAD.NO. P.S. Also added a persistent kali .mnu file in the \docs folder so you can boot from Kali direct from ISO with persistence. I have made a few tweaks to improve speed - before it took 24 seconds to boot to the main menu with over 30 payload files, now it takes 22 seconds! Please re-download BETA16 v2 or later. small fix for FASTLOAD added to version again and again! - see BETA16 v4! Bugfix - please update to v6! Improved the Windows Install menus. Added support for XP Pro Volume licence and XP Enterprise ISOs. Vista/7/SVR2K8R2/8/SVR2012 now can have any number of ISOs and you can type in the name of the ISO you want. Tutorial 72a has been updated. now has new extension of .isowinvH for Hirens boot ISOs. You can now add a grub4dos batch file to change the keyboard mapping to work with UK, German, French, AZERTY, QWERTZ or Japanese 106 keyboards. Simply copy one of the KBD_xxxxxx.g4b files in the grub folder to make a file called KBD.g4b and it will be used to change the key code mapping. If you find any probkems with the mapping or have new mappings, please let me know (or better yet, send me your own working KBD_xxx.g4b file!). The various Linux folders needed to be Linux (capital L) and not LINUX (all uppercase) to match the .mnu files. New .mnu files added to support persistence with some linux ISOs. Click here for the new version. It has a demo of how to add various DOS floppy images, linux isos, ERDCommander, KonBoot floppy image, plop iso, Norton Ghost iso, BartPE ISOs, StartOS ISO with persistence, Full Monty from ISO with persistence and BackTrack 5 from ISO with persistence - all on the same USB drive (plus, of course, any Windows install ISOs and linux ISOs that you have room for!). I have changed the folder structure and function yet again! You can now place almost any payload file (not just .ISO files!) in certain folders and they will be automatically listed in the menu and run according to their file extension. This menu shows the file ERDCommander.isowinv - the .iso extension has been changed to .isowinv so that WinVBlock will be loaded as a floppy disk image at the same time as the ISO is loaded as a CD. This allows ERDCommander to boot successfully. A list of extensions that are recognised by Easy2Boot can be found on the Tutorial page. Take a look at the file \grub\QRUN.g4b to see what actions will be used for each type of file extension. so that this line is used as the title line instead of just the name of the payload file (MEMTEST.img). This new version adds a new Quick Test menu item. It can be removed by simply deleting the \mainmenu\qtest.mnu file if you don't want it. The MainMenu folder allows you to drop only ISO files in, but the QTEST folder allows you to drop any type of file in it (including ISO files) and test it. If you have a file (bin,ima,zip,img,gz etc) that you want to quickly test, just copy it into the \QTEST folder. It will be listed by the Quick Test menu option and then executed according to it's file extension. This allows you to quickly test all types of executable self-boot files without needing to add a grub4dos menu. For more details, see here. is the code that will execute on any .bin file. If you want to add another extension type (e.g. .binss), simply add another entry - e.g.